(04-06-2016, 12:50 PM)pedwards Wrote: I'm not entirely sure as it's seems a bit sketchy based on who and when it was posted, but I think it's not hdmi 2.0 is because the g-sync tech doesn't support it. Could be wrong as I'm getting my info from reddit but guess will utilize the display port. Monitor is only 100Hz vers 144, but still better than 60 should be good enough for eliminating ghosting. I'm also thinking that the 2nd screen using this may just not be possible. The monitor is huge. "Flawless Widescreen" huh? Never heard of it but I just looked it up and it looks slick. Great recommendation. Yeah, I really am anxious to hear both about the next gen for both. Also if AMD Zen will start to compete with the Intelopoly. So next question. I'm now asking - M.2/PCI-e worth it? Leaning towards not using all those slots in the ASR at all given there will be no noticeable difference between that and a SATA SSD. That and I can get a larger SSD then for cheaper. BTW - PwnBroker - what are the specs of your current rig now that we're talking about you waiting until end of year. Is it posted somewhere here? for gaming system the best bet is a larger capacity sata 3 ssd. this youtube video pretty much shows the real world differences. notice the boot up and civilization load time differences, very little difference. i have 2 systems an amd and intel, and both are older but still very functional. an fx-8150 on an asus 990fx, an i7-3770k on an asus sabertooth. both have corsair h100 all in ones, thermaltake docker cases. a samsung sa350 on the amd system and a benq gw27 1440p on the intel. i upgraded to a gtx 960 on the intel system and it suits me just fine for now, until bf5 comes out this year then we will see. the amd system i use for virtualization and networking labs and it still has the hd 6850 that i put in there 5 years ago, lol. i closed my shop 2 years ago but i still do occasional builds to keep up with the tech as time permits. running a shop and working for the largest telecom,oops, largest "entertainment" company in the world for 20 years was starting to take its toll on me. good luck on the new build, sound like its going to be pretty cool. Hey Dan-H! Good to hear from you as well. (04-06-2016, 02:50 PM)Dan-H Wrote: If you need the I/O throughput 25Gb/sec might be worth it vs 6 GB/sec for SATA III. M.2 has different speeds depending on the MoBo. Some are 25Gb/sec, and I've read 32Gb/sec might be possible. My Z97 chipset is 10Gb/sec max on the m.2 slot, but there are PCIe adapters. I haven't felt the need to spend that money and am suffering with only one 500GB SSD right now. and my wonder is will I really notice a big difference from 6GBs to the supposed 32GB/s of this MoBo in most my activities. Granted I did have fun editing Go Pro videos recently, it's not what I do on a day to day basis. Also is it correct that M.2's use lanes from the PCI 3.0 which I assume doesn't interfere with the GPUs, then I guess it may be interesting albeit expensive. Not looking to put this into RAID or anything, just wondering what perceptions would be on boot and general use/gaming. Perhaps it's almost blasphemy to get a board with 3 of these slots and not at least have the boot drive setup that way, eh? But I'm second guessing the MoBo pick, but that's an entirely other discussion. (04-06-2016, 02:50 PM)Dan-H Wrote: Here is an interesting review. A little out of date but still a good read. btw, I went with Cryorig R1 ultimate. On my board, the first PCIe slot is blocked, but it is a 1x slot so it isn't a problem. Cryorig makes a printable / fold-able mockup gadget to use to test fitting the cooler. I'm not sure about the other brands, but you could use it as a what-if, and then compare it to other coolers. Also, I recently replaced the R1 fans with Phantek's. The Cryorig fans were fine except I could not get them to spin down as slow as I wanted. On my MoBo, using PWM CPU header, I could only get them down to 780 RPM and at that speed I could still hear them at idle. The Phantek's spin down to 600 rpm at idle and I cannot hear them. Top-end cooling seems to be the same or in other words, not an issue. You might also look at the NH-D15 as an option. Yup, saw that report as well, although I didn't notice that it was the D15 versus the D14 at first! So going with the NH-D15 at the end. The whole story with the D14 originally is I bought 3 yrs ago is I bought the version for the SB-E before I changed my mind to go with the 2600K. Now I learn the D14 LGA 2011 version isn't compatible with brackets for the LGA 1151 boards. Oh well! Will try to sell them here to see if I get something for them. (04-06-2016, 10:04 PM)PwnBroker Wrote: for gaming system the best bet is a larger capacity sata 3 ssd. this youtube video pretty much shows the real world differences. notice the boot up and civilization load time differences, very little difference. Ah great, will check out that video. I was writing up my last post but guess I didn't refresh before posting when I read Dan-H's comments earlier. Whoops. So will check the difference, and won't have any guilt about higher capacity SSDs in that case. I thought you still ran a shop, and was very jealous but I bet it's harder given the Amazon/NewEgg/BH in today's market. So I have a strong indication which "entertainment" company you work for, as it may have bought a division of my company company, but will keep our convos focused on the HW... LOL. So for virtualization and networking labs... what type of work do you do around that? Do you use like VMs and such for testing work-type scenarios or things like folding? Also would both of you mind looking at that Tom's hardware review of the ASRock Z170 OC Formula - it says "Editor's Choice" on like New Egg but then it says "Editor Approved" without a very flattering comment. It says OC - great, but other features - average for what it could be. Am I reading too much into it? Also I'm not quite understanding the I/O benchmarks from TweakTown that has the network throughput test at like middle of the road (393) with the comment "It performs as we expect it should for a Z170 MoBo". It looks like the wired results for all the other MoBo's in it's class are at 900+ while the lower scores are Killer Wireless scores for these same boards? Seem odd to any of you? Granted I really like ASRock, and want to OC this puppy (incl RAM) and this board makes it easy - but questions pop up like seeing PCI 3.0 8x8 versus 16x16 and wondering if I'm not sacrificing some capability from this chipset? Thanks for your effort & energy fellas. Other thoughts (and other members thoughts) are very welcome. (04-07-2016, 01:25 PM)pedwards Wrote: Hey Dan-H! Good to hear from you as well. Thanks. I like to follow these discussions to try and stay current for my next someday/maybe build. (04-07-2016, 01:25 PM)pedwards Wrote: With the ASR board (Z170 OC Formula) I'm looking at it seems to state it has: 3 Ultra M.2 (PCIe Gen3 x4 & SATA3) and my wonder is will I really notice a big difference from 6GBs to the supposed 32GB/s of this MoBo in most my activities. Granted I did have fun editing Go Pro videos recently, it's not what I do on a day to day basis. The way I understand the Z170 chipset is the MoBo builder has a lot of choices. 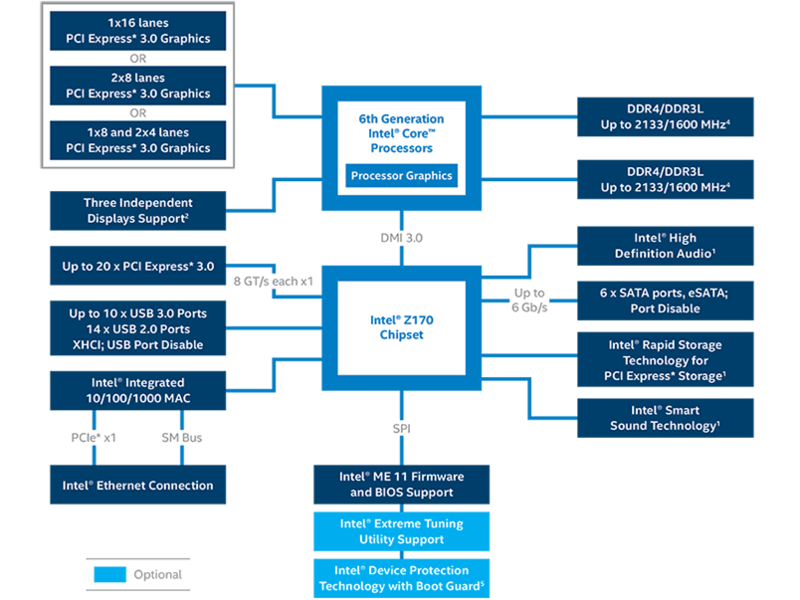 It seems like the high-end MoBo builders are leveraging the extra PCIe 3.0 lanes from the chipset for the fast storage options and this doesn't compete with the 16 lanes of PCIe 3.0 direct to/from the CPU used for graphics cards. per the asrock specs, it looks like the m.2 slots combine the data paths used by two SATA 3 and one SATA express ports. It also looks like the m.2 slots can be configured for SATA type SSDs or PCIe x4 type SSDs so the flexibility is there if you need it. 500GB PCIe x4 SSD as the boot drive and for most of my programs. (04-07-2016, 01:25 PM)pedwards Wrote: The whole story with the D14 originally is I bought 3 yrs ago is I bought the version for the SB-E before I changed my mind to go with the 2600K. Now I learn the D14 LGA 2011 version isn't compatible with brackets for the LGA 1151 boards. Oh well! Will try to sell them here to see if I get something for them. Got it. I didn't know you already had a D14. Did you see this? Not sure if it applies to your D14 or not. I've read Noctua's support is top-notch and this seems to reinforce that. Good luck, and it sounds like a fun build. Thanks for responding so quickly Dan-H.
Geez, I really did NOT do my homework. That makes much more sense. I was reading about the myriad of trade-offs here, but I never sat down and mapped it out. So this is a great summary. So.... stupid question time. I've read about the NVMe SSDs, and the U.2 kits... is that the PCI-e GEN 3, 4 lane that essentially sticks a M.2 into a PCI-e card slot adapter or is it a specific type of M.2 SSD? Specifically the part that states: ... and M.2 PCI Express module up to Gen3 x4 (32 Gb/s)**. It is literally amazing the diversity in SSD bandwidth and flavors there are since I got my original Samsung SSD a few years ago. WOW! I would love to know how you came up with that. That almost brings a tear to my eye. LOL. So the swap drive would be a system hidden in windows I assume? Is there performance gains to have a dedicated swap drive? Assume the spinner would be a WD black? Very cool to see your dream storage setup. Honestly could do this setup budget wise, but how cheesy would it be for someone to copy it? Also I only think about if I had this much data, backing it up would be very fun even if I'm doing it from my Ubuntu NAS. You guys are great... make me think about options, and clarify a few confusing points I had. Next will look at RAM and what PSU to look for... but that a bit later as it's almost 11pm my time. (04-07-2016, 03:43 PM)pedwards Wrote: So the swap drive would be a system hidden in windows I assume? Is there performance gains to have a dedicated swap drive? My intent of using a separate SSD for the swap file is to push the swapfile work to something cheap and not worry about it. 64GB M.2 SATA speed SSDs are dirt cheap. I don't know if it makes a difference or not. I might pick one up for my current system. I have tried with the swap file on different drives and I'm not sure it really makes much difference. Indeed an interesting read on the HDDs Dan-H. Had started it yesterday but didn't finish as I was on my way to work. Once me chores are done will go back to it. Notes: In case you're curious, picked up Thermal Grizzly Kryonaut thermal paste to give it a go, want to avoid CLU although that's what was used for the CPU delid. Used eXtreme Power Supply Calculator with all the OC's accounted for and assuming PCI-e, full M.2 SSDs, 1 spinner, plus plethora of USB stuff to get around 920W. So didn't look for higher than 1000W. Anything I missed? What if I plug in a (for example) Occulus Rift? I have no idea how much power it requires but I see it requires 2x USB 3.0 ports? Should be minimal? I wanted finless RAM chips that could handle 3200 clock speeds, but everywhere I looked keep pointing to the G.Skill Rampage Vs.
Again I wanted to say on Air, so looking at the D15, they made a single fan config with 64mm w/o fan #2. However if we are talking with the 2nd fan, it's only 32mm. Couple that with the fins of the gskill rampage v which is 40 or 42mm worst case, means that would have to adjust fan 2 to + 10 mm at least which brings the height to 175mm. CPU cooler height: 186.0 mm / 7.3 inch - tight! "Seems" I would still have 10mm wiggle room - aka 1 cm! Hmm. Yes realize that RAM speeds make virtually not much impact, but would at least like to test my hand with this board given it's supposedly built for this. Plethora of PCI-e,M.2,SATA drive SSD/HDD options. Saw Matthieu posted an article a few days ago, and will read Dan-H's article w/ suggestions. I assume the sound card should be OK as included with the MoBo? Only using headphones - razors. Anyway thanks for following me on this adventure thus far. PSU looks good. I think 1000W should be fine. Rift doesn't use much. RAM clearance: you will want the NH-D15 in dual fan mode, and if it pushes a fan up a little as long as your case clears it will be fine. I had to push the front fan of my Cryorig R1 up about 3/8 inch and it clears my case, but I have a pretty wide case. SSD: I honestly don't know what to recommend. If I were rebuilding my system today, I think I'd go with a 1TB SATA3 SSD and a 4TB spinner. I don't do enough disk intensive workloads to really justify the PCIe x4 speed SSDs. HDD: my only reservation about WD Caviar Black is they are noisy. I don't know if the new ones are as noisy as my older ones. I have two. One is un-plugged /powered off with a full image backup of my SSD just in case. When clean my case, I plug it back in, re-clone the SSD to it and then unplug it again. The second is used for scheduled backups and it spins down after about 15 mins and don't hear it until the backup runs again. Case: lots of choices and a lot is preference. I'd sort out your hard constraints first. - do you need a 5 1/4 bay for an Optical drive or a front mount fan controller? - how many HDDs/ SSDs total? - side window or not? - size? (including width) does it matter? For example, I have the Fractal R5 and it is pretty big, but it has a lot of flexibility. I wanted an optical drive and use it frequently. If I didn't need this and if it were available when I built my system I would have considered the Fractal S. The S mounts three HDDs on the back vertically along with two SSDs and this enables a third front intake fan. The case is setup for water cooling but looks like a great air cooler too. with three front 140mm intakes and a fourth on the floor of the case it should move all that hot air out the back with ease. If not you can add more exhausts on the top as needed. I wanted quiet and didn't care about a window so I went with a solid side panel with sound dampening. Again, these are my choices for my preferences. What are your preferences? And, I don't know what is available where you live. You mentioned it is not US so some of the choices I have might not be available and vice versa. It looks like a great setup. My only "gripe" is the fan color of the NH-D15, and there are options to change the fans if that bothers you. looks like your are off to a running start! danh suggestions were spot on(i like reading his posts). on the pcie lanes question, and i think that they touched on this in one of those articles, it is possible to borrow lanes from the pciex16 slots so you will have to be careful where you slot cards. if i am reading the slot assignments correctly, x8,x4,x8, this tells me that the 2nd slot is tied to the cpu via pch/dmi path. next x8,x4,x4,x4- this tells me that the fourth slot borrows 4 lanes from the 3rd slot. my opinion on the MB is like the review, the high overclocks is what commands the price of this board. only 1 nic chip would not deter me from using this board especially with the price drop from introduction. in my opinion a board with x16,x16 pcie lanes via a plx chip is a waste of money at this point in time with gaming. your question about how those 3 m2 slots are connected, asrock used 3 intel 750 sff-8639 versions with m2 adapters in raid config for their demo. sff-8639 is what sata express should have been in the first place. im with danh on the pcie ssd's, sata3 ssd's are fast enough for me and couple them with properly partitioned hdd or hdd/ssd(like i use) and everything is happy in storage land. BUT, if i was running a video streaming server or some other data heavy application where latency could cost money, then i might consider them. right now im running type 2 VM's for coding experiments for Openflow. our company is going to require just about every employee working on the network to have a BSCS. i have a BSEE with some programming language experience so go figure. edit: as for the swap file(im assuming the page/virtual memory file) on another ssd. the way i look at it, with the latest wear leveling algorithms your gonna get 20 years of 50GB per day writes(which most people will never write that much). by that amount of time they will probably fail for some other reason than P/E cycles anyway. one drawback that i can see with having it on a non system partition is the failure of a crashdump and being able to use BSOD's for OS troubleshooting. Haha! You guys are great. Replying in tandem - good stuff. So regarding the M.2 vs. NVMe - yeah agreed. I even think having a NVMe would be not very pragmatic unless I put it in one of the 3rd or 4th slots given where my GPUs would reside. Would be confusing then plugging in other drives it my boot drive is not on the first channel, but that's just me. I'm only smiling about Dan-H's dream scenario where I think there was 4 different storage tech used simultaneously. I think it would just be fun. One regard I was seriously thinking about the M.2's now, after quite a bit of snooping around was: very space optimal, no cables required (power nor SATA), and having it in RAID 0 would not necessarily make it faster as much as it would make the reaction time "snappier". I like snappy. LOL. Ok well normally I would avoid RAID 0 like the plague, with 2 pricey/GB options... but would be fun at the same time. Like the RAM OC... fun, albeit not overtly practical. And I found crucial 500GB that I never used, will start with that to begin with I think. Either way I think I'll go with the one or two M.2 SSD(s) / SATA 3 SSD(s) + one 3-4TB spinner. Probably sticking with WD? Now on to the box. Entirely agree - function over form here. I love my CM Storm Trooper, but the number of times I'm looking inside my case on the floor - practically nada. And not to poke fun because I'm exactly the same way was Dan-H's comment about how the sound is more important than having the window as he doesn't look inside, but then complained about the color of the NH's fans. LOL! Love it. I agree on both counts, and I guess that's what makes us special! 2 SSDs, 1 HDD max.... although I will note that I loved the SATA dock I had on the Storm Trooper as I could use a cheap 40GB corsair I used as my OC Windows install and BSOD to my heart's content, re-install, etc. Also if I wanted to try new drivers or configs - very convenient without harming my main install. Window - on the floor anyway, so meh. I would like enough width given the RAM heatsyncs I mentioned earlier. Rest would be oriented around maximizing airflow - SIDE NOTE: given I have 2 cards, one with a backplate, one without... makes sense to have the one with the backplate on top right? Or remove it? Place it on the bottom card? I mean the thing is interchangable. styles I like - I did like the Cooler Master Cosmos II look, Fractals look cool but guess front ports/panels are something I'd like. Then PwnBroker's expertly guided points on the PLX chip is what I was thinking as well. Just wanted to make sure I wasn't missing something gaming or perf wise. Only point is wasn't sure if the example you were giving was for the ASR board I planned to get? It's limited to 8x8x as far as I know.. but if it's 8x4x8x for the Xtra 4 lanes per the Skylake PCH will indeed pay attend to card layout. Appreciate all the support again gents! by the x16 pcie layout that they list in the specs then the sli 980ti's will need to be slotted in slots 1 and 3. you can use slot 2 for another pcie device at x4 speed which is tied to the pch/dmi. if you place a pcie device in slot 4 then it will take x4 lanes from slot 3 which will make your sli inoperable. (nvidia does not allow sli at x4). sorry for not being clear. i know this is confusing from the above block diagram. edit: the slots assignments above i used the physical location for slot number as counted from top to bottom from cpu. after consulting the manual these slots are labeled as pcie1,pcie2,pcie4,pcie6. so per the manual for dual sli, they should be slotted in pcie1/pcie4.